Most football fan will tell you that when it comes to double-legged knockout tournaments, it’s better to play at home in the second leg than away. The idea is simple – the away team has the option (luxury) to play it safe (park the bus), aim for a draw, and then bank on winning the home game. Not the most elegant approach, but an effective one nonetheless. But while the story is written by the pundits, the truth is written in the numbers. A 2007 paper by Lionel Page and Katie Page, of the University of Westminster and University of Queensland respectively, looked to find just that. The first academic research of its kind, the study made significant advancements but ultimately fell short of conducting a proper analysis of the phenomenom. It wasn’t until a follow-up study was conducted by three researchers from the Ludwig Maximilian University of Munich that the truth was uncovered: playing the second leg at home is, statistically speaking, irrelevant. It’s not hard to see why this myth has so much traction. On the surface, data from the Champions League fits the narrative: teams play conservatively in the first leg and open up in the second. This is reflected in the increase in goals scored in the return leg. Additional calculations by Michael Cox of Zonal Marking for the 2007-2009 Champions Leagues confirm the findings above. That is, with the exception of 2010, more goals are consistently scored in the second leg of CL knockout rounds than in the first. This phenomenon can work for and against a team playing at home during the second leg. On one hand, the away team is less likely to sit back and park the bus. This lets the home team exploit their home advantage and take control of the deciding match. On the other hand, in a game that’s decidedly more ‘open’, a goal for the away team counts for double. Ideally these two effects would balance out and we would observe a 50-50 chance of advancing, even if more goals are scored in the second leg (e.g. if a team goes 1-0 at home and then loses 1-2 away, the away goal rule would outweigh the home field advantage). Since we know more goals are being scored, the question becomes: for whom? Between 1994 and 2009, 56 percent of teams which played the second leg of a Champions League tie at home advanced to the next round. On the surface, this suggests home-field advantage frequently outweighs the benefit of the away goal rule. But these findings are not sufficient. 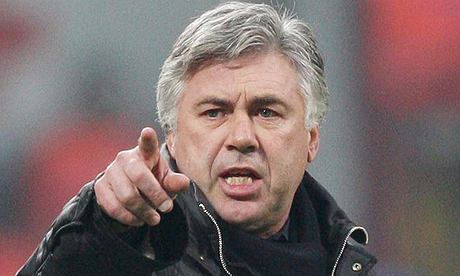 They do not take into consideration that the order of home-away matches for the CL round of 16 is not random. In fact, group winners first play away, then at home. This was instituted as an added incentive for group winners, based on the very myth itself. This creates a sort of a self-fulfilling prophecy. Seeded teams play at home in the second leg, and it’s not clear if they win because they’re the better team, or because of their home-field advantage. In their 2007 paper, Lionel Page and Katie Page look examine this specific aspect. Together, they use data from three different European Cup football competitions over 51 years in order to assess the accuracy of the second-leg advantage myth. One solution they assess is to simply not look at data from the round of 16. Later rounds no longer seed home-away match order, randomizing the process and eliminating possible bias. But they find that this approach considerably reduces the sample size, and makes it harder to obtain meaningful results. 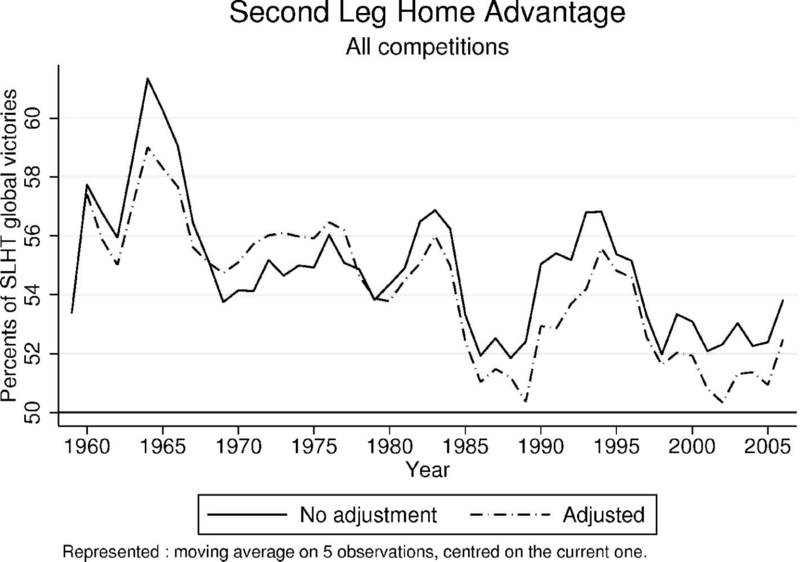 This graph shows an overall decrease in second-leg home advantage, both adjusted and unadjusted for team coefficients, over time. Interestingly enough, the decrease in the late 60s in this advantage can be traced to the introduction of the away-goals rule. By increasing away-goal value, the tactic of parking the bus away and winning at home was no longer as effective. For a team playing away, losing wasn’t the end of the world, but scoring an away goal could be the difference that would send them through. The temporary decrease in advantage between 1984 and 1990 coincides with a five-year ban on English club participation in European competitions as a result of the Heysel Stadium disaster. This suggests that, at the time, English clubs exhibited a more significant second-leg home advantage than their European counterparts. In fact, seven out of eight previous European Cup winners were English. It’s possible that part of this success was the ability to exploit the second-leg home advantage in either the form of favorable refereeing or by employing the ‘defend away, win at home’ strategy. At this point, readers would be right to ask: what about the away goal rule? Why does everyone believe there’s an advantage to playing the second leg at home when the away team has the opportunity to play an extra 30 minutes where their goals count double. Page and Page actually look into this. They analyzed 186 European cup ties which go into extra time and found that the probability of winning the second leg at home is 66.42%. These results are adjusted for team ability, regardless of the fact that ties going into extra time might reflect equally-skilled teams. Page and Page also find that matches that go to penalties on the home ground result in the home team winning 57.33% of the time. Simply put, the advantage of playing at home for an extra 30 minutes considerably outweighs the advantage of having goals count for double for the same period of time. Note that, whether or not there is an advantage to playing at home first, home advantage is a very real phenomenon. However, in order for their model to work, the two effects cannot be correlated outside of their impact on the dependent variable (in this case, the round of 16 performance). If you’re a little confused right now, you should be. This is the same problem Page and Page thought they were solving. But their analysis was rudimentary: you can’t simply control for correlated effects in order to isolate them. Suppose you have three variables A, B, and C. You hypothesize that A and B both positively affect C. The data shows as much: A, B, and C all rise together. You could jump to conclusions and assume you were right from the beginning. But really, B is positively affecting A and C, giving the illusion your initial hypothesis was correct when in fact A is completely unrelated to C.
For example, imagine that the US government introduces a new anti-smoking campaign. The campaign is a success, and raises the population’s life expectancy. The government also chooses to raise taxes to fund the campaign. One might observe taxes rising and mortality rates decreasing and falsely conclude that paying more taxes means you’ll live longer. Likewise, Page and Page observe a lot of teams play the second leg at home because they’re good and win their group, and falsely assume that they win the next round because they played the second leg at home. In reality, a better team will have a higher coefficient going into the tournament, and will not only do better in the round of 16, but is also more likely to have the second-leg at home. This leads them to overestimate the effect match order has on the outcome. Three researchers from the Ludwig Maximilian University of Munich took a closer look at the data, and noticed what Page and Page did. To solve for this issue, they controlled for group stage performance in order to completely isolate the home-away match order effect. Any effect team coefficients have on match order is now funneled into the group stage performance variable, giving them clear results. The researchers found that, once they controlled for group stage performance, playing the second leg at home had no impact on a team’s chances of success. It turns out that the team that progresses is usually just better than their opponent, contrary to the superstitions of some of football’s greatest minds. 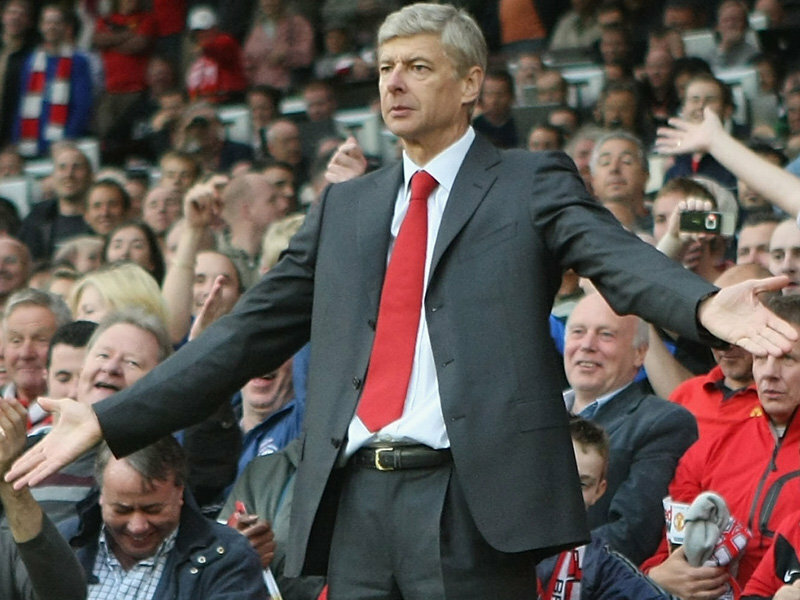 Maybe this is the reason Wenger has been so successful – he knows when to listen to the numbers.